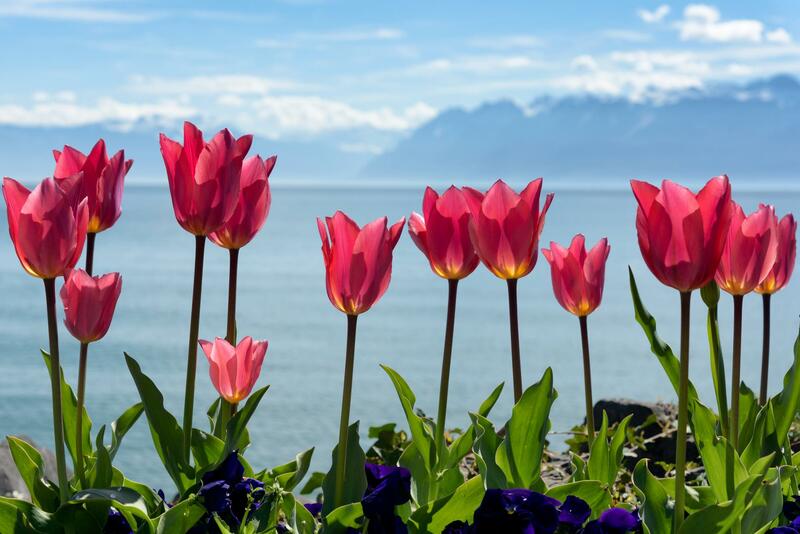 As soon as it gets warmer, more and more people like to admire the thousand-and-one colours of the spring flowers in the canton of Vaud. These fans of nature have no idea that the multicoloured petals aren't there for them but for me! And who am I, might you ask? A bee, naturally! Plants put on their finery to better attract me and other pollinating insects and animals. By gathering nectar from them one by one, I carry their pollen and ensure their renewal. So I’m well placed to share my selection of the most beautiful flower shows and flowered spaces in the canton of Vaud. Immediate takeoff! And who am I, might you ask? A bee, naturally! I was born at the beginning of spring. From my first excursion, I was attracted to a medieval town on the shores of Lake Geneva: Morges. Here, in a place called Parc de l’Indépendance, I was thrilled to discover more than 120,000 tulips and various varieties. Enough to feed an entire hive, if not more! I noticed that the visitors to the Tulip Festival prefer the flower buds, but I like them open, when they invite me to taste their nectar. But I’m not the only one who is feasting. Brunches and other theme meals are regularly organised for children and adults. I was thrilled to discover more than 120,000 tulips and various varieties. Enough to feed an entire hive, if not more! 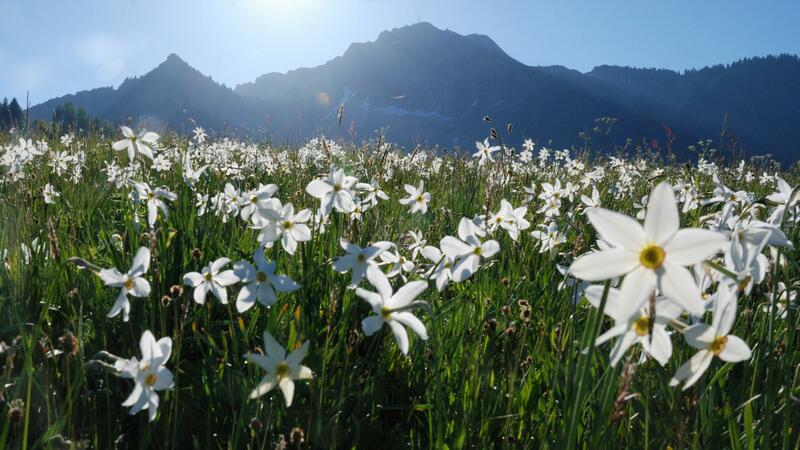 Above Montreux - on Pléiades, in Glion on Mont-Pélerin, at Avants and in Caux - when the sunrays have melted the snow, a different kind of white coat covers the meadows: narcissi. Beholding so many flowers on wild meadows is a unique spectacle in Switzerland. This view with Lake Geneva and the Alps as a backdrop impresses even tiny ones like me! Daffodils, the cousins of the narcissus, also cover entire meadows on the hill of Mormont in Eclépens between La Sarraz and Echallens. I’m dazzled by the beautiful yellow and white hues of the narcissi and daffodils. But my pleasure is purely contemplative because these flowers don't provide enough nourishment for me. 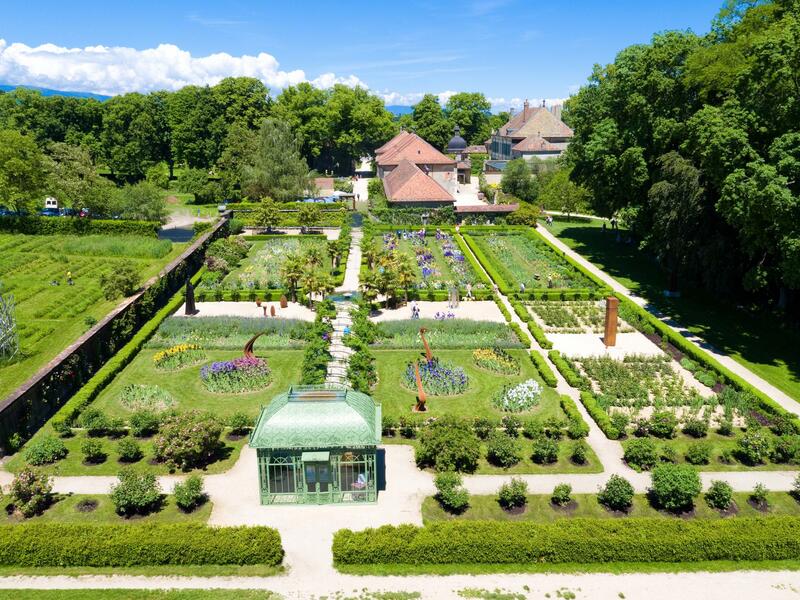 The gardens of the castle of Vullierens above Morges are among Switzerland’s finest. They are best known for their 400 iris varieties but also have many other flowers on show, something to make us bees happy! This is where we find nectar and pollen during the entire opening season of the gardens, from mid-April to October. 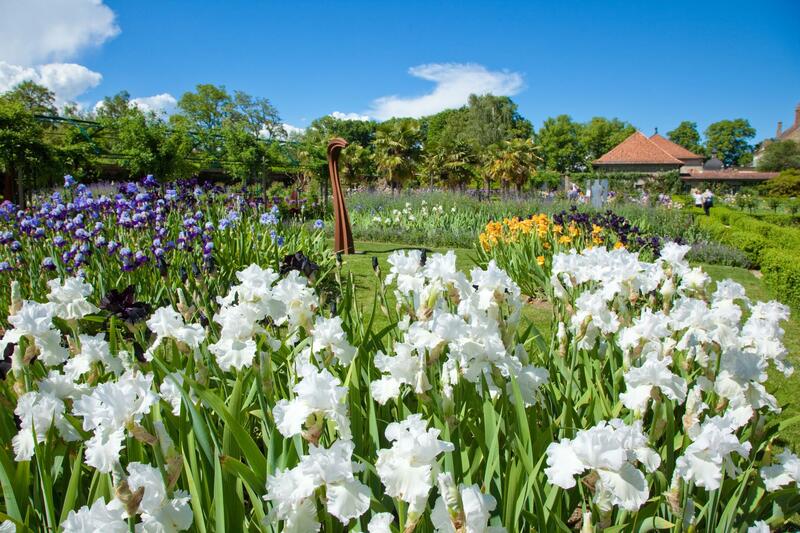 Visitors who wish to recreate these flower shows at home can purchase bulbs of iris and lilies, the garden’s other flagship variety, which flowers in midsummer. While gathering nectar in the Gardens of Vullierens, I meet strange sculptures, more than fifty of them! And I hear the happy laughter of wine fans who are tasting another kind of nectar - that from the castle’s vineyards. 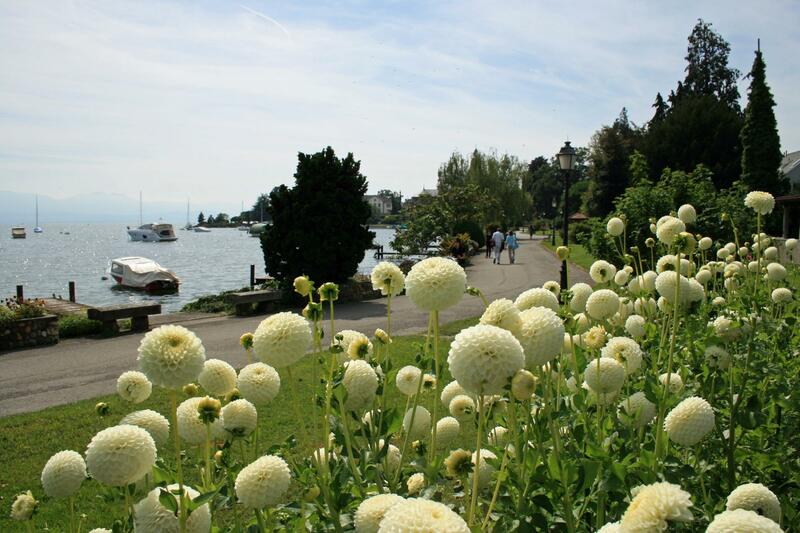 Some 2,250 dahlias of all colours and shapes decorate a mile of lakeside promenades along Lake Geneva during a flower show called the Dahlia Lakeside Promenades in Morges. The bees born in spring will unfortunately not live long enough to see more than a hundred varieties of this flower that originated in Mexico. But my fellow bees born in autumn will be able to enjoy their nectar before spending a winter in the warmth of the hive. There, they will be looking after the larvae that will be ready to spread their wings in the following spring! Although the city is not always the best of places for us, we don't mind visiting it from time to time. 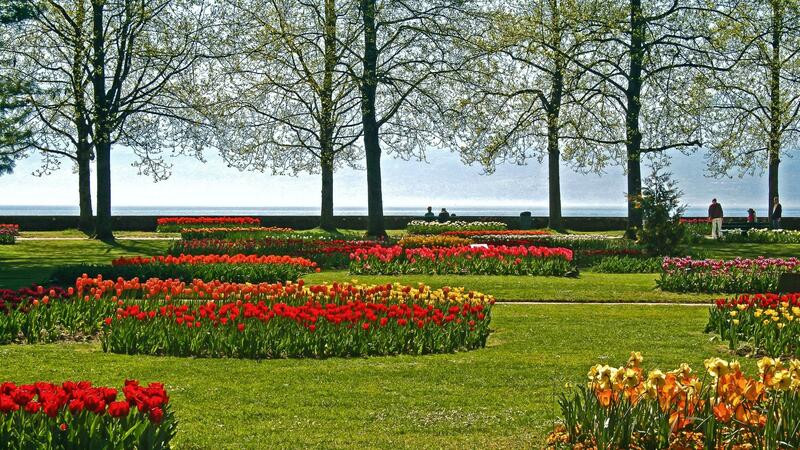 Especially if this excursion takes us to Lausanne, one of Switzerland’s greenest cities. This summer, there’s a very good reason to fly all the way to the Olympic Capital. 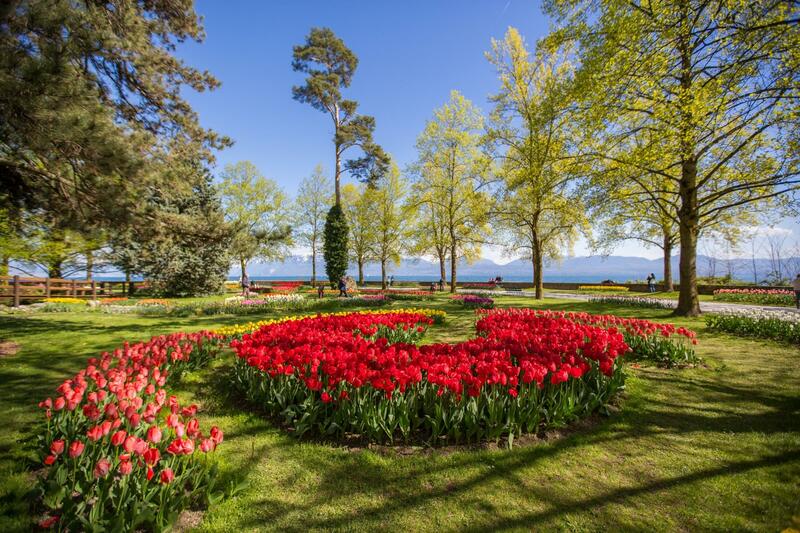 One of Europe’s largest landscape events, Lausanne Gardens, will be taking up its headquarters in twenty green spaces around the city. Although some of the contemporary and artistic creations don’t supply much nectar, there are other, extremely promising flowerbeds. 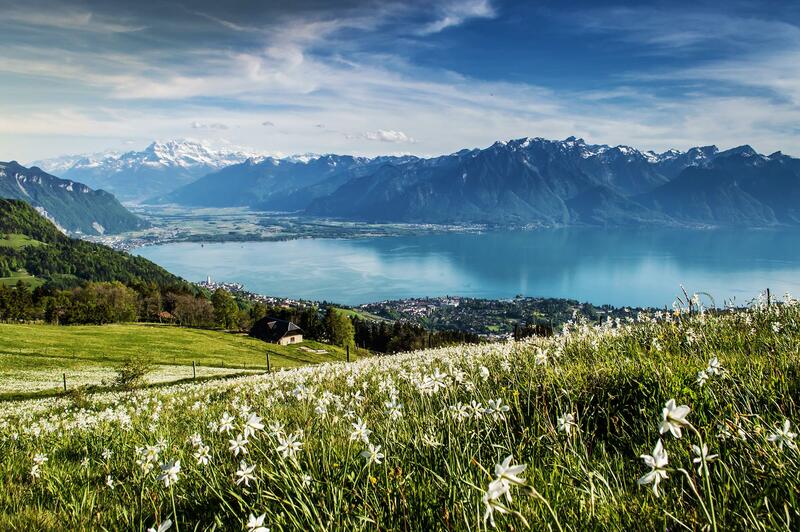 In the canton of Vaud, you can combine two fun activities during the summer season: hiking and admiring nature and its flowers in several well-preserved sites and on marked paths. Those who would like to imitate our little bee can follow the Via Francigena. This international itinerary crosses Eclépens and its meadows covered by daffodils. The Narcissi Path is dedicated to fans of these immaculate flowers. This path provides a pleasant two-hour loop across fields covered with wild plants between Montreux and Les Avants. But why not go a little higher up to see the Alpine botanical gardens of Rambertia on Rochers-de-Naye, Thomasia at Plans-sur-Bex or Gentiana in Leysin? 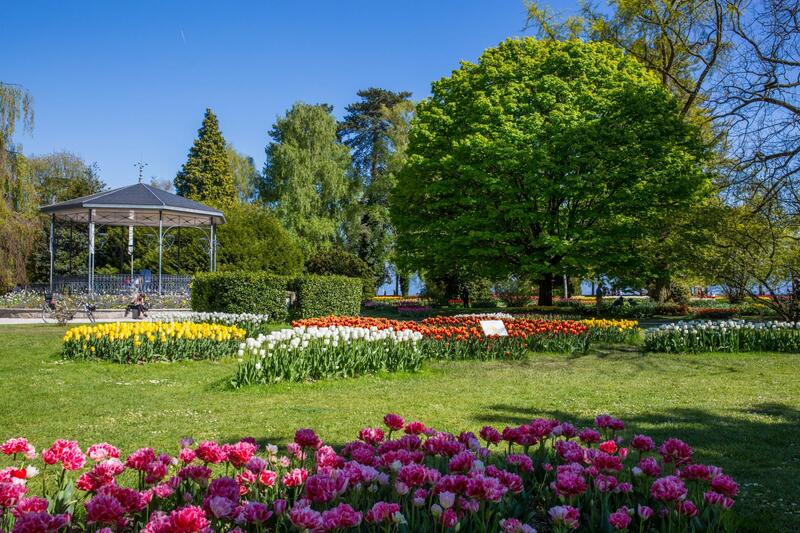 Back down at the lakeside, you won't be able to resist walking along the shores of Lake Geneva to enjoy the multicoloured spectacle of the Tulip Festival or the Dahlia Lakeside Promenades. 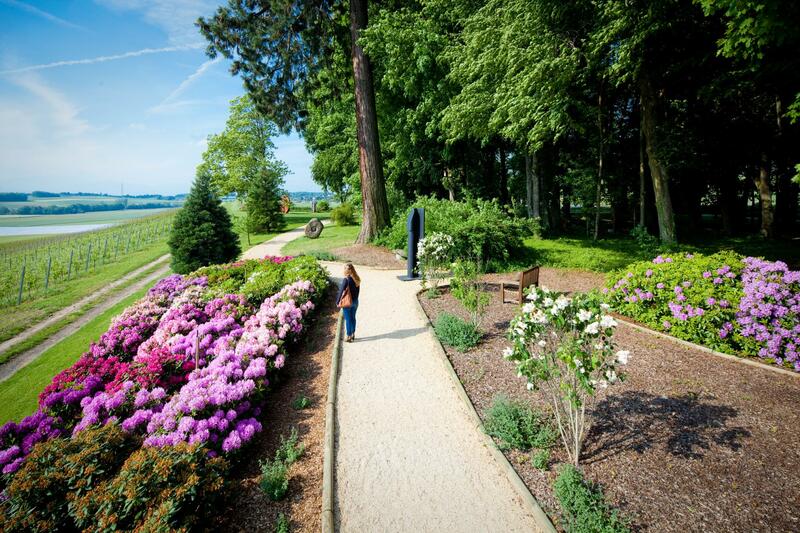 A few miles away, the unique Arboretum at Vallon de l’Aubonne exhibits tree and flower varieties from all around the world. And to learn more about our little bee, the Vaudois Jura Park organises educational activities teaching children everything there’s to know about this lovely pollinating insect. Flowers are not only a feast for the eyes, but sometimes also for the taste buds! Edible flowers are becoming increasingly popular in terroir cuisine and high-end gastronomy. They are within everyone’s reach, provided you learn how to distinguish and pick them. In the canton of Vaud, the various workshops and guided walks on offer provide unique educational experiences. The Alpine garden Les Tussilages in Les Diablerets offers a harvesting and cooking activity each summer. In Sainte-Croix, the hiking guide Thaïs Cornaz offers a cooking workshop based on wild flowers and plants. Pascale Fesquet of Aster Rando accompanies participants in Le Sépey, Leysin and Les Mosses and teaches them to make donuts, humus, sandwiches and even pizzas with the things they gathered on the way. Vie Sauvage in Bonvillars isn’t about gastronomy but about immersing yourself in the environment of the Jura foothills during workshops of varying durations. No need to become a hunter/gatherer to enjoy the savours of edible flowers: in his Restaurant Peppino within the Eurotel Victoria in Villars-sur-Ollon, Chef Joël Quentin prepares tasteful meals with the ingredients of his own pickings.